This month, we introduced new features and updates in Microsoft 365 that help teams streamline management of tasks, make it easier for IT admins to manage Windows 10 devices, and empower small to medium-sized businesses to grow. Keep everyone on the same page with @Mentions in Office apps—Today, we’re introducing @Mentions in Word, PowerPoint, and Excel. This capability makes it easier to work together on shared documents, presentations, and worksheets by giving you the ability to get someone’s attention directly within the comments. If you’re @Mentioned in a document, you’ll receive an email notification, so you know exactly where your input is needed. @Mentions will start rolling out in September to Word Online and PowerPoint Online and to Word and PowerPoint for Windows and Mac for Insiders and will be coming to iOS, Android, and Excel in the next few months. Learn more in this support article. Tag coworkers with @Mentions directly in Word. Enable remote actions on Windows 10 devices—FastTrack for Microsoft 365 now offers deployment support for co-management on your Windows 10 devices to help you get the most of our your Microsoft 365 subscriptions. Co-management enables a Windows 10 device to be managed by Configuration Manager and Microsoft Intune at the same time, giving IT admins the ability to enable remote actions on devices—including factory reset and selective wipe for lost or stolen devices. Get started by going to our FastTrack website. We are introducing several new capabilities in Microsoft 365 to help small and medium-sized businesses improve teamwork and build their business. Discover and securely share videos with Microsoft Stream—This quarter, we’re making Microsoft Stream available to small and medium-sized businesses by bringing it to Microsoft 365 Business, Office 365 Business Premium, and Office 365 Business Essentials. Stream is an intelligent video service, which makes it easy to discover and securely share videos from across the organization, with features like auto-generated and searchable transcripts, and AI-powered speaker detection. Discover and securely share videos across the organization–all in one place–with searchable speech-to-text and AI-powered speaker detection. 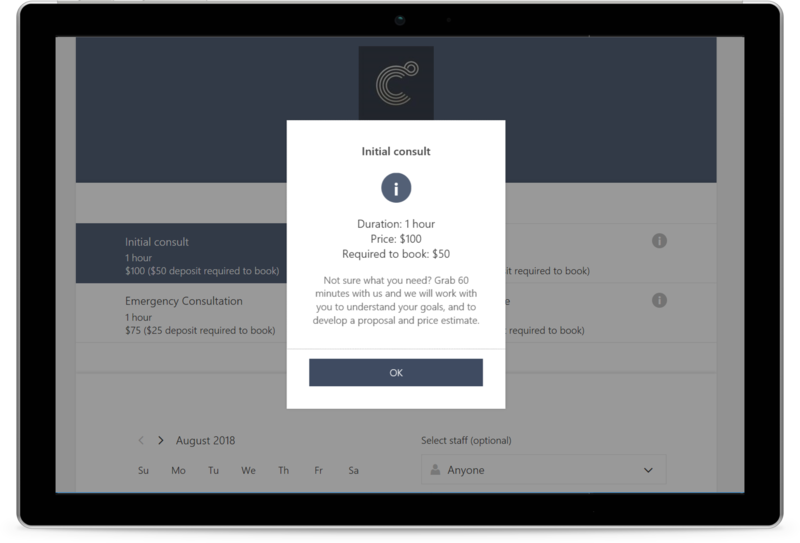 Get paid faster and manage mileage expenses more easily with new integrations—Now you can collect pre-payment from customers when they book an appointment with you via Microsoft Bookings—a great way to reduce no-shows. You can also now provide customers a direct link to Microsoft Pay from within invoices generated by Microsoft Invoicing, providing a convenient and secure online payment option. In addition, mileage tracking app MileIQ now integrates with Xero and AutoReimbursement.com to help you log mileage and manage vehicle reimbursements quickly and easily. These capabilities will roll out to small and medium-sized business customers in the U.S. in the coming weeks. Reduce no-shows by collecting pre-payments with Microsoft Bookings. Hire the best talent with LinkedIn Jobs—Eligible small and medium-sized business customers can now receive $50 off their first LinkedIn Jobs post. LinkedIn Jobs reaches more than 500 million LinkedIn members—most of whom aren’t visiting job boards but are open to new opportunities—enabling you to reach relevant candidates not accessible elsewhere. The platform matches your role with the right candidates and provides recommended matches that get smarter over time. This offer applies to customers with a subscription to Microsoft 365 Business and Office 365 Business Premium, Business, and Business Essentials who use the LinkedIn Jobs pay-per-click pricing model. In the coming weeks, information about this offer, including terms, will be emailed directly to eligible customers. Access live events in Microsoft 365 to connect leaders and employees across your organization and engage with communities, content, and communications. Ink and text annotations are now available for the Office Lens mobile app. Starting October 2, 2018, get even more out of Office 365 Home and Office 365 Personal by installing Office on an unlimited number of devices. Find out more on our blog. New capabilities in Microsoft 365 combine the power of artificial intelligence and machine learning with content stored in OneDrive and SharePoint to help you be more productive, make more informed decisions, and keep files more secure. Next articleHow can i simulate a load for downloading a file for 500 users?